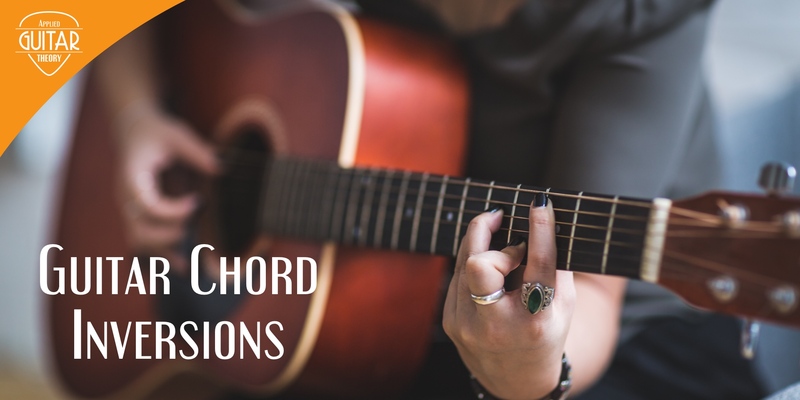 Building chords from the major scale sets the foundation for writing and understanding chord progressions, transposing to other keys, and developing your ear as a guitarist. If someone asked you to play a 1, 4, 5 in the key of C would you be able to? Do you know the quality of the 6 chord in a major scale? If the answer to these questions is no, this lesson is for you. So let’s get started. Before we get into building chords from the major scale, let’s start with the building blocks of chords, the triad. Triads are a group of three notes that are all a 3rd apart. You’ll also see this referred to as “stacked” in 3rds. Specifically, triads are made up of the root, 3rd, and 5th degrees of the scale. For instance, if we consider the G major scale (G-A-B-C-D-E-F#), the triad built from the first degree of the scale (counting from G) would be G-B-D.
To further explain the above, major 3rds are formed when the interval between 3rds is 4 semitones (2 whole steps). 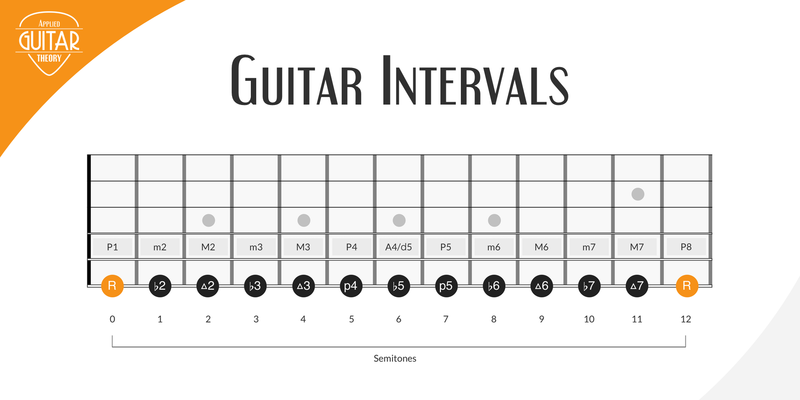 Minor 3rds are formed when the interval between 3rds is 3 semitones (1 1/2 steps). A perfect 5th is 7 semitones from the first note, while an augmented 5th is 8 semitones and diminished is 6 semitones. The quality of the triad built from each degree of a scale determines the quality of the chord at that scale degree. To build the chords of the major scale, you build triads from each scale degree. As stated above, the quality of the triad formed by each scale degree determines the quality of the chord. Below we build triads on each degree the G major scale to form the chords in the key of G major. After going through the exercise above of building triads from the G major scale, you end up with a formula of major and minor chords that holds true for all major scales. The formula is summarized in the table below. *In music, Roman numerals are used to notate chords by scale degree. For example, vi represents the chord at the 6th degree of the scale. Capital numerals are used to denote major while lowercase is used to denote minor. **You see the 7th chord referred to as diminished and/or minor flat 5. Although referred to differently, they’re both the same chord as a diminished chord is a minor chord with a flattened 5th. By applying the major/minor formula created by building chords of the major scale to the fretboard, we can easily map out the relative positions of the chords of a key. This is particularly useful when writing chord progressions, transposing to another key, playing with other musicians, and easily identifying the chords of a key on the fly. If we map out the chords of the major scale to the fretboard, there are a couple of patterns that emerge that make it easier to visualize and pick-up chord progressions. Note the solid note markers indicate major chords while the hollow markers indicate minor chords. The root note of the scale is orange. A chord progression is just a sequence of chords. Rather than referring to chord progressions by name (G – C – D), you may hear them referred to by degree (ie. I IV V). This allows musicians to easily transpose a progression to any key. To help you become fluent in locating chords based on number, play through the following chord progressions using all three patterns from the diagrams from above. The strumming pattern you use for the rhythm isn’t important. On each chord change, call out the number of the chord being played. This will help make the association between location and quality of the chord. Taking the chord progressions from above, let’s transpose them to different keys. To do this, you only need to shift the patterns to the root note specified by the major key. If you’re not familiar with the notes on the fretboard, I recommend you read Learning the Notes on the Guitar Fretboard. You’ll need to be able to identify the root notes of the major scale. Play through the examples below, paying attention to the relation of the chords to each other. You can play them in the keys outlined here, but also feel free to transpose them to other keys as well. One other very important aspect of this exercise is ear training. Listen closely as you move from chord to chord and notice how the chords sound in succession. Over time as you develop your ear you’ll be able to identify chord progressions by hearing them only and, likewise, know how a chord progression will sound before you ever play it. 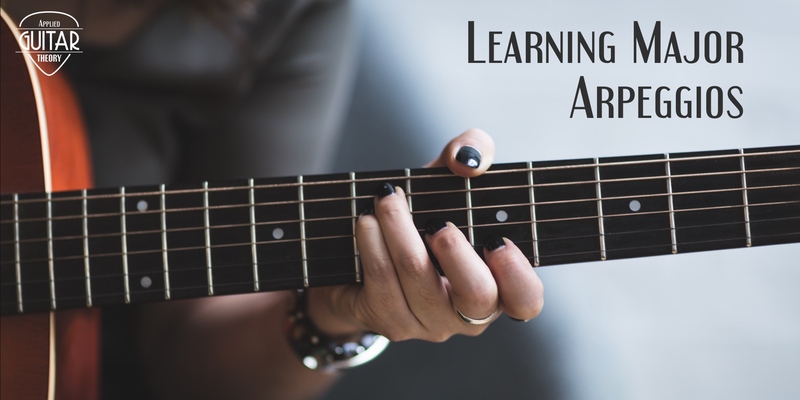 In this lesson you learned about building chords using the major scale. Triads (root, 3rd, 5th) are the basis for chord building and determines the chord quality for each scale degree. Using each degree of the major scale, you can create chord progressions in any given key. Playing by number easily allows you to transpose chord progressions to any key.